a variable radical -R, that is the functional group (in red in the table) of the amino acid. 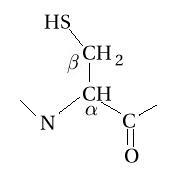 Chemically speaking, an amino acid is a carboxylic acid which has an amine group attached to it. The general linear formula of an amino acid is R-CH(NH2)-COOH. Click here for IMGT classes of the 20 common amino acids 'Physicochemical' properties. Charged side chains are POLAR. The general formula of an amino acid is composed by a carbon alpha atom, a carboxyl group, a side chain group and an amino group. Molecular formula: structural formula with the carbon alpha atom and the radical of each amino acid. 3D molecular model: a ball and stick model of the amino acids is shown. Oxygen, hydrogen, nitrogen and sulfur atoms are represented by colored spheres (Oxygen: red, Hydrogen: white, Nitrogen: blue, Sulfur: yellow). The carbon alpha atom is represented by black sticks and other carbons by grey sticks. Representation of an amino acid example (cystein) engaged in a peptide chain and showing the carbone alpha and the carbone beta.